The Steelers hold the 28th pick in the first round of the NFL Draft. The needs of this team are fairly clear, but it has been hard to project what exactly the Steelers will do with their first round pick. The biggest needs are at at inside linebacker, safety, running back, and cornerback. They have spent some time on depth defensive linemen and wide receivers. They have also scouted the second tier of quarterbacks. The Steelers have spent very little time scouting edge rushers and tight ends while almost completely ignoring offensive line prospects. Taking this into account, the Steel City Blitz braintrust got together and created a First Round Draft Board that was weighted based on the Steelers team needs. As we discussed many times on our SCB Podcast Draft Previews, the Steelers were in their nickel defense over 70% of the time last season (and over 60% in each of the last four seasons). The time has come to start thinking of the nickel defense as the base package (whether that be a 2-4-5 or a 4-2-5 alignment) rather than thinking of the 3-4 as the base. This diminishes the necessity of a true nose tackle and increases the necessity for #3 CBs and for linebackers and safeties that can hold their own in coverage. Taking into account the Steelers team needs and the prospects they have shown interest in during the draft process, here is a list of 10 players the Steelers could potentially select with the 28th pick. Why the Steelers will draft him: The Steelers met with Rudolph at the Combine and at the Oklahoma State Pro Day. Kevin Colbert has said he wants to draft Ben’s successor before Roethlisberger retires. Rudolph is in the “second tier” of quarterbacks after the top 4 that will likely go in the top half of the draft. Why the Steelers won’t draft him: They have much bigger needs than quarterback right now. Picking Rudolph would be a move for the future but wouldn’t do anything to help the Steelers in 2018. The Steelers are set at QB for 2018 with Ben, Landry Jones, and Josh Dobbs. Why the Steelers will draft him: Jackson is a dynamic playmaker who won the Heisman at Louisville as a dual-threat quarterback. They met with him at both the Combine and at Louisville’s Pro Day. Why the Steelers won’t draft him: Basically the same reasons as Rudolph, with the added exception that Jackson may be off the board by the time the Steelers pick at 28. He has drawn some interest from teams in the middle of the first round, including Baltimore. Why the Steelers will draft him: The Steelers have invested a significant amount of time on Derrius Guice during the pre-draft process. As discussed on Episode 69 of the SCB Podcast (covering RBs and WRs), the Steelers approach to running backs will tell us a lot about how they view Le’Veon Bell. If they wait until Day 3 to take an RB, then they believe Bell will be the Week 1 starter. If they draft an RB on the first two days, then they may believe Bell will extend his holdout into the season (possibly as long as Week 10) and are drafting an RB to start immediately. Guice is the second-best RB in the draft class and can be a 3-down back in the NFL. Why the Steelers will draft him: The buzz around the Georgia RB has grown over the last few weeks and some analysts now think he will be the second RB off the board. Michel has a solid all-around game with breakaway speed and good hands out of the backfield. Why the Steelers won’t draft him: If Michel is the second back off the board, it’s possible that he doesn’t make it to Pittsburgh at 28. The Steelers may also view RB as a luxury pick this year and focus on bigger needs on the defensive side of the ball. As discussed previously, the need at RB is somewhat dependent on how long the team believes Le’Veon Bell will sit out. Why the Steelers will draft him: Goedert is the best all-around tight end in the draft. He has displayed both receiving and blocking abilities – a rare trait for collegiate tight ends. He has the size, speed, short-area quickness, and overall athleticism that teams covet in a tight end. Why the Steelers won’t draft him: The Steelers have not drafted a player in the first round from outside the FBS during the Kevin Colbert era. The last time the Steelers used a first round pick on a player from an FCS/DI-AA school was in 1996 when they took Jamain Stephens from North Carolina A&T. The Steelers do not have a huge need at tight end and may view their depth chart as set with McDonald, James, and Grimble. Why the Steelers will draft him: The Steelers love highly athletic players and have the biggest need at inside linebacker to replace Ryan Shazier. Vander Esch is the third best ILB available (both Roquan Smith and Tremaine Edmunds will likely be off the board in the Top 15) and has the second-highest SPARQ score of all off-ball linebacker prospects. He has elite athleticism and can be a 3-down Mack linebacker for the Steelers. Why the Steelers won’t draft him: Vander Esch has drawn interest from nearly every team picking in the second half of the draft. It is very possible that he is not on the board by the time the Steelers pick at 28. Additionally, the Colbert has generally used his first round picks on players from “Power 5” conferences. Ben Roethlisberger is the only one of Colbert’s 18 first round picks that did not play at a Power 5 school. 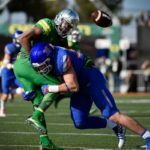 Why the Steelers will draft him: If Vander Esch is off the board, Evans is the next best inside linebacker prospect and the only other ILB worth a first round pick. His film shows a rangy linebacker that can play sideline-to-sideline and attack downhill against the run. Why the Steelers won’t draft him: Kevin Colbert has never drafted a player from Alabama. The last Bama player drafted by the Steelers was DeShea Townsend back in 1998. Additionally, Evans did not display elite athleticism in his testing and the Steelers have tended towards players with high athletic metrics since the Jarvis Jones pick in 2013. Why the Steelers will draft him: If the Steelers miss out on the four linebackers, a safety could be a fall-back option as the team’s next biggest need. Currently, the Steelers have a depth chart at safety with all strong safeties and no true free safeties. Reid has the ability to play the single-high free safety role and would fill a need for the Steelers. Why the Steelers won’t draft him: The Steelers did not have a big contingent at Stanford’s Pro Day, moreso because it fell on the same day as Ohio State’s rather than having anything to do with Reid. That said, Reid could get snagged by one of the teams in the early 20s as the top 2 safeties (Derwin James and Minkah Fitzpatrick) will both be off the board in the top half of the draft. Why the Steelers will draft him: Bates can play the single-high free safety role similar to Justin Reid. The Steelers showed interest in him, taking him out for dinner after Wake Forest’s Pro Day. Why the Steelers won’t draft him: Bates is not one of the top choices and would likely only be the pick if all 4 linebackers and 3 safeties were already off the board. Why the Steelers will trade up: This draft is relatively short on elite talent and there are a lot of teams picking ahead of the Steelers that have similar needs (inside linebacker and safety). If the Steelers think that the player they want won’t make it all the way to them at 28, then trading up may be the only way to get him. Why the Steelers won’t trade up: The Steelers have not made a draft-day trade since 2013. Additionally, the Steelers have never traded their first round pick during the Mike Tomlin era. The lack of a 4th round pick may make it difficult to put a package of picks together worth moving up. Why the Steelers will trade down: There are some very intriguing scenarios for the Steelers to trade down into the early second round. Why the Steelers won’t trade down: The Steelers have not made a draft-day trade since 2013. They may want to stay in the first round to have the 5th year option on the contract of the player they take. The Steelers have used that option on all but one pick since it was installed in the latest CBS. Why the Steelers will draft someone else: I listed 9 prospects here. With the 28th pick it seems unlikely that one of the top players would slip all the way down the board. The Steelers played things close to the vest this year and did not use all 30 of their pre-draft visits, which is a sign they are very confident in their scouting of most players. It is possible they have their eyes on someone that has completely slipped under the radar. Why the Steelers won’t draft someone else: I laid out a number of contingency plans here based on the Steelers highest positions of need. I did not list some of the top players at those positions – the “Big 4” QBs of Rosen, Darnold, Mayfield, and Allen or the top 2 ILBs of Smith and Edmunds or top 2 safeties of James and Fitzpatrick. All 8 of those players will almost certainly be off the board in the first half of the draft. 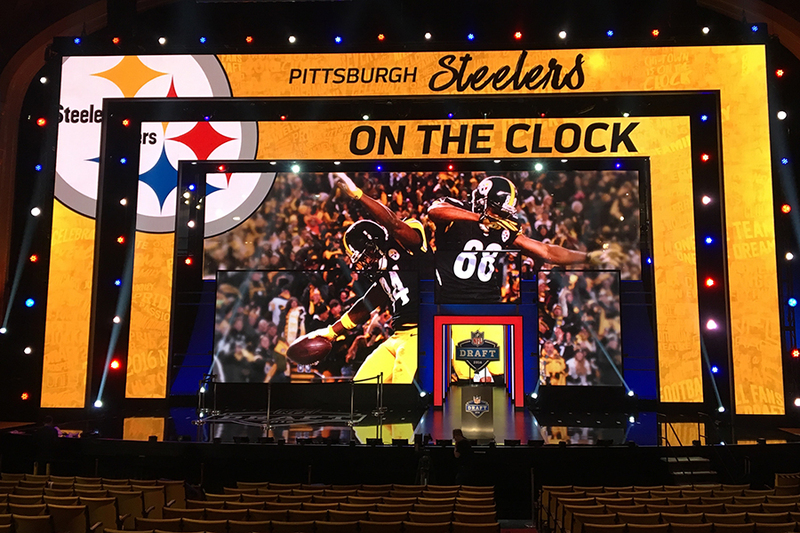 Add in a few offensive linemen, defensive linemen, cornerbacks, and potentially a wide receiver, it is likely the Steelers will have their choice from a number of these players at the 28th overall pick.